Every American realizes that the people of the United States face threats to their safety, health and economic well being that are not being addressed by Congress. Congress has a favorability rating in the single digits, yet we continue to re-elect the vast majority of its members every two years. The reason is that most Americans seem afraid to face the greatest threat: that the Democratic experiment may fail because of rabid partisanship, for which we are ultimately responsible. The dangers our government is failing to address pose a threat to the rest of the world given the economic and military dominance of the United States over other nations. If we want a government of, by and for the People, we must achieve consensus on where we want our leaders to take us. That requires forging a consensus on what kind of America we want to leave our children. This is the crux of the dilemma in which we find ourselves. If we cannot agree on what we want our elected officials to do, then they will continue to do as they please. That is generally to keep themselves in office by catering to the interests of the special interests that pay for their obscenely expensive election campaigns. Our task as Americans is thus to end the ability of the moneyed few to control the electoral process. As long as we continue to labor under the delusion that one party or the other represents our interests, we will continue to fight each other instead of the plutocracy that controls our government by virtue of their wealth and power. When both parties concede that they must continue competing for special interest money, supporting either unconditionally makes us complicit in a system that is driving America away from the path to true democracy. Democracy cannot exist where a people are not good enough to rule themselves.That means a society that does not assure that the rights and needs of all of its citizens is not a true democracy, which is predicated on the notion that every citizen has equal opportunity to thrive in that system. It does not mean that wealth is redistributed by the government. It means that one of the roles of government is to ensure that an economic aristocracy does not arise to take control of it. We as a nation have failed to do that. We are a society where teachers are demonized for contributing to the economic decline because they dare to demand decent pay and health care in exchange for preparing our children to be productive and responsible citizens.The assault on teachers is just one piece of the general effort to wage class warfare on the worker. In attempting to systematically destroy unions by taking away the right to collective bargaining that Reagan once said was fundamental to democracy, the wealthy are attacking the entire middle class. If we do not realize that and work together to protect ourselves, we will fail in our duty to leave our children a world better than we found it. Jefferson taught that democracy cannot survive without educated citizens. He knew that a People who forget its history is condemned to repeat the mistakes of the past. The battle between Americans like Jefferson who wanted a nation of free people and those who refused to abandon the notion that a few privileged individuals had a divine right to rule over the many has been going on since the founding of the nation. We are at a time in history when we must finally finish the Revolution born in the blood shed by those who gave their lives for the freedom of all people, including generations of men and women around the world yet unborn. If we are to ensure that the last, best hope for Mankind does not perish from the Earth then we must put aside the artificial distinctions that divide us and work together to end control of the government by special interests. That means that we must decide what it is that we can all agree is the minimum expectation of those seeking our votes in 2012 and beyond. In my view, that is their pledge to support a constitutional amendment to end the ability of wealthy and powerful special interests to control the electoral process. 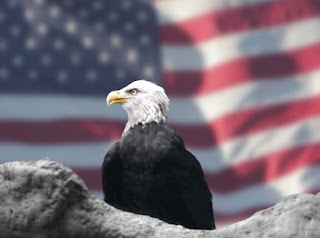 This is a collective, nonpartisan cause that will require us to reject the fallacy that the unique characteristic that makes one an American is the individual freedom to do as one pleases with no regard to the effect of our actions on others. The true character of those who founded our nation was defined by their willingness to put their lives and sacred honor on the line for the sake of fighting liberty and justice for all people on Earth forever. Afterward: What is the unique nature of Americans? The corporate media and politicians would have us believe that the unique thing that defines American character is the common belief that individuals can succeed on their own without the aid of government or help from others. While this may define the term American exceptionalism, it is yet another Bolsevization of our history. The truth is that America was created through the shedding of blood by men who believed in the inalienable right of all men to live free, While at its inception this was far from true in America,most of our history represents a constant struggle to assure these rights in the face of corporate oppression and the selfish, racist and xenophobic impulses of a powerful minority. The American Revolution started when colonists put aside their differences in the common cause of making democracy in the world possible. We cannot complete the Revolution until Americans decide to do the same, rejecting the idea of American exceptionalism and defining ourselves as citizens of the world, responsible to each other for our mutual survival and prosperity.